These larger foggers are excellent for areas of 3 to 8 feet in diameter to fog. Accent your upcoming events, birthday parties even your indoor green house! 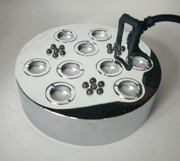 Foggers operate in water only, no chemicals are ever needed. Simply, put the fogger in its buoy, place in water and plug it into an electrical outlet and you are all set! It's the disk that produce the fog. The more disks the more fog the unit will create. 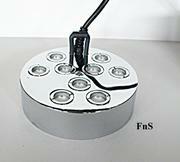 Products humidity and negative ions by vibration of the disk. Foggers come with a buoy for maximum performance and their own transformer. Best fogger for indoors or outdoor use when you want a LOT of fog! Perfect for use in a green house when you need a lot of moisture. Comes with its own buoy for maximum performance. 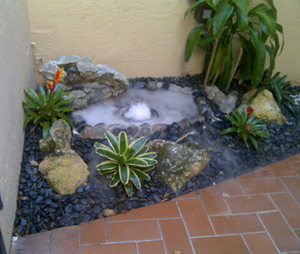 Will fog an area approx.�6' - 8' in diameter!